2015-16 Epoch AC Milan Series 1 honors one of the biggest and most successful clubs in the world with a factory set. While each box includes a full base set, a premium element comes into play with one guaranteed autograph or match-worn relic. The base sets includes 24 cards documenting most of the starters on the 2015-16 squad and the head coach. The first 19 cards are traditional base cards, while the last five are combo cards that pair two players together. These 19 base cards are also found as a Signatures parallel with on-card autographs. Other hits include a mix of autographs and relics and all options are numbered. Signed on-card, Primary Signatures cover most of the team with a bold design. There are also Signed Match-Worn Equipment cards that feature a hard-signed autograph and several relic pieces. Falling under the Match-Worn Shirt inserts, Match Worn Shirt with Letters and Big Logo/Patches, etc are the two options. Perhaps most intriguing, a special jumbo Match-Worn Shirt Booklet card for Keisuke Honda makes an immediate impression. While it will be officially distributed in North America, the set was first released in the Asian market in December of 2015. 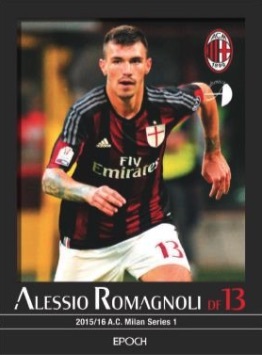 The product largely mirrors the Epoch offering for AC Milan's chief rivals, Inter Milan. Includes Match Worn Shirt with Letters; Big Logo/Patches, etc. 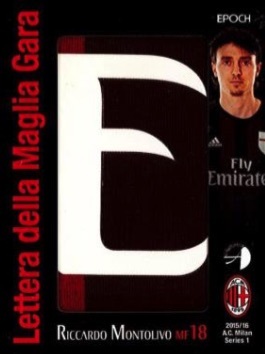 Very nice A C Milan boxed set. Bought 2 boxed sets; and all cards very nice; and got an autograph card with nice signature in one box and limited jersey card, three color, in the other box. 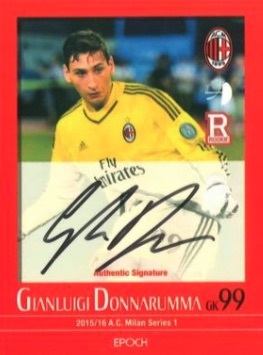 The rookie card of 16 year old goal keeper, G. Donnarumma makes the set. 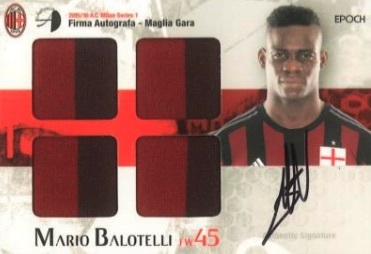 Highly recommend this A C Milan football set.